The famous CLAMP brings back the characters from all their creations for an ultimate showdown in this multi-dimensional tale. This is the story of four travelers, bound by fate and by a treacherous journey. Sakura is the princess of Clow Kingdom, and possessor of a strange power that promises to change the world. Syaoran is an aspiring archaeologist and her childhood friend. When a powerful but elusive figure decides to use Sakura’s abilities for his own ends, her memories take the form of feathers and scatter across countless dimensions, and Syaoran is forced to go on a desperate journey to retrieve them. 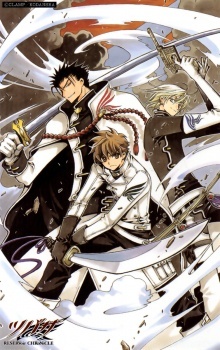 While seeking help from the Dimensional Witch, Syaoran and Sakura meet two more strange travelers. They are Fay D. Flourite, a magician fleeing his home world and his past, and Kurogane, a rough-mannered ninja trying to return to the home from which he was banished. They agree to accompany Syaoran on his quest so they can begin their own. However, the ability to cross worlds demands a great price, and each of them must pay the Dimensional Witch what they value most. Longing to restore the princess to her old self, Syaoran agrees to pay that which he values most to save her—their relationship. Even if he gathers all of Sakura’s memories, she will never remember their past together… But the very moment the group forms, their destinies are sealed into a tragic course. True motives surface, affections shift, and prophesies become real. The future reads only of betrayal, abandonment, and devastation—unless the mismatched travelers can change it.